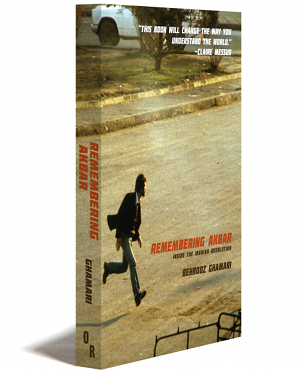 Set in the tumultuous aftermath of the Iranian revolution in 1979, Remembering Akbar weaves together the stories of a group of characters who share a crowded death row cell in Tehran’s notorious Evin prison. A teeming world is evoked vividly through the relationships, memories, and inner lives of these political prisoners, many of whom were eventually executed. Told through a series of linked memories by the narrator, Akbar, whose striking candor is infused with a mordant sense of humor, the story takes the reader beyond mere political struggles and revelations, to a vibrant alternative history, written, as it were, by the losers. The characters whose stories Akbar recounts are brought to life within the mundane rhythms of a bleak institution, in its simple pleasures as well as its frequent horrors, and in the unexpected connections that emerge between the world inside and a past before imprisonment. Rather than exalting the heroic, or choosing to focus merely on despair or redemption, Remembering Akbar reveals eloquently how life unfolds when death is starkly imminent. It is a deeply moving story of great camaraderie, biting humor, and soulful remembrance. I died at 7:30 in the morning, on December 31, 1984. I do not say this as a metaphor, but in a real existential sense. At that exact moment, I set foot into another world with a reluctant signature at the bottom of a page, a release form. The blurry lines from under my blindfold apparently granted me a medical parole with the proviso, as the guard clarified it, that my body had to be returned to prison for an official identification. It took me a few years to realize that I had actually died in that early morning. That had nothing to do either with survivors’ guilt, or with the weight of life’s banalities. I left behind the self I knew without any worldly means of retrieving it. The boisterous voices that called in unison for the end monarchy now only sang in dissonance. Communists, socialists, liberals, nationalists, women, workers, university students, ethnic and religious minorities, young revolutionary clerics, and grand cautious ayatollahs claimed with injudicious certainty the true meaning of the revolution. The thirst for power turned friends into foes, revolutionaries into security officers, prisoners into interrogators, community leaders into spies, urban guerilla fighters into assassins, teachers into morality police, students into snitches, friendly chats into insoluble quarrels, and family gatherings into political disputes. In less than two years, we saw with sober eyes that prison walls grew taller and behind them atrocity thrived virulently. “I am not accepting any conditions for my release,” I said, thrusting the words painfully out of my closed throat. They resumed the banter they’d began the previous evening. Twelve hours earlier, two guards had come to the infirmary room that I shared with another prisoner, Mohammad, and asked me to pack my belongings. “Pack your belongings” had become the most dreaded expression of my death-row years, and usually had only one meaning. “You’re going to be freed,” one of the guards announced without trying to hide the self-congratulatory smirk on his face. He turned around and repeated the word “freed,” seeking recognition from the other guard of his ingenious exploitation of the double meaning it evoked. He wanted to make sure that Mohammad and I appreciated his pun. I put the few items I owned in a tiny brown bag without engaging the guards. I put my blindfold on without being asked. I knew the routine and only wished to be spared hearing the grating voice of the guard. They took me to the main hallway of prosecutors’ offices and asked me to sit there until someone called me. I had another, much better incentive for putting my blindfold on without being asked. I wanted to make sure that I used the one I had owned for a couple of years. The one from the middle of which I had carefully pulled out a few threads to make the outside world visible, no matter how shadowy it seemed. I scouted the crowded hallway, knowing that I was not the only one with the secret see-through blindfold. Majid spotted me first. He inched his way over slowly and finally reached my corner. “You’re still alive,” he said. I wasn’t sure whether it was a question or a statement of fact. Majid had been 16 at the time of his arrest in 1981. I had witnessed how the soft line above his upper lip turned dark and coarse into a real moustache during the period we spent together in a death-row cell. “Tonight is the night, Majid,” I told him. Although I did not want to sound pathetic, my wobbly voice suggested otherwise. “They’re setting me free.” I repeated the guard’s words almost involuntarily. Weary of these ultimatums, I’d told the judge that I was already dead and his threats were meaningless. The judge asked me to take my blindfold off. “Hajj Agha! ?” the courtroom guard protested. For fear of reprisal, the judges and interrogators never allowed prisoners to see their faces. The judge had asked me again to remove my blindfold. He too must have thought that I was already dead and thus seeing his face would do no harm. His face looked tense despite the calm and concerned tone of his voice. He did not look like any of the faces I had imagined him to have. A brownish copious beard, light skin, and dark blue eyes gave away his northern origins. How unusual for an obdurate judge to come from the shores of the Caspian Sea. I thought I should sometime tell mother, who always blamed my father’s obstinate character on his Azeri roots. I pulled out a few pieces of handicrafts I had made, two prayer beads, though I had no faith in prayer, made with date pits, and a miniature picture frame put together with rolled up paper. He refused to accept them. “You’re going to be fine,” he told me, which was the kind thing to say. “Take it.” I insisted, and he did. In exchange, he gave me his precious volume of Hafez’s Divan. “Remember our poetry nights?” Majid whispered as he put the book on my bag. “Drink,” he said, reminding me of how we used to find reading Hafez intoxicating. I closed my eyes and made a wish. Opening the book somewhere in the middle, I silently asked Hafez to tell me without ambiguity what would happen to me. That was asking for too much. The poet never spoke unambiguously. I opened the book repeatedly with no resolution. I read page after page of the most beautiful words, strung together for the sole purpose of evoking infinite possibilities. I do not know why at the center of such certitude, knowing my fate, I needed Hafez to speak to me with clarity. He refused. When they called my name, I kissed the book and put it next to Majid’s bag. Even the screeching voice of the guard who called me did not wake him up. I did not realize that almost twelve hours had passed since I’d started reading the poetry. That was how I died, by stepping out of an inconceivable world and entering another universe of perplexing banalities. I left my former self behind in a place that exists only in incommensurable terms. For many years, I tried to open a conduit to the world I left behind—to the moment of death, to the humor that preceded it, to the horror that defined it. I tried to describe the unfathomable. Every New Year’s Eve, I still try to relive the last day of my previous life. I vacate the present at 7:30 in the morning on December 31st and do not return until a new year has begun. Every December 31st gives birth to a story. I write for twelve hours, exactly the same number of hours I spent with the poet Hafez during the last day of my previous life. Sometimes I write five pages, sometimes twenty, and other times only a few lines. I never know what will come when I sit to write. I only know that I should let my body feel the coldness of the hard floor on which I sat for those last twelve hours.